By 1976, with the introduction of LCD displays, digital watches and digital calculator-watches powered by button cells became very practical. 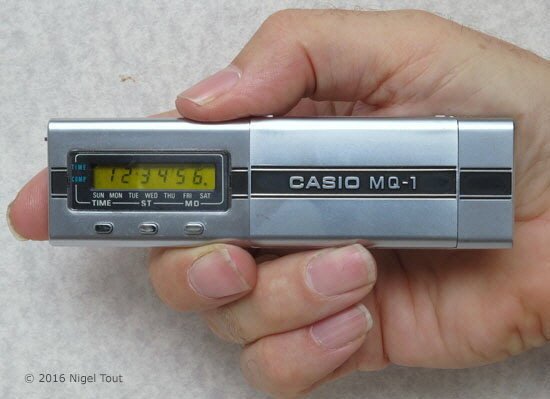 Around this time Casio introduced some very tiny standard calculators, such as the micro-mini, and approached the digital watch from the other direction by incorporating a clock in a tiny calculator rather than incorporating a calculator in a watch. This resulted in the MQ-1 and the MQ-2. Distinctive features: Tiny calculator with clock and stop-watch. Can perform time and date calculations. Display is 6 digits, LCD (yellow-filtered to cut out wavelengths of light harmful to the LCD). 4-function, time and date calculations, clock, stop-watch. Date calculation from January 1, 1901 to December 31, 2099 (so is Y2K compliant), taking leap years into account. It can calculate the number of days between two dates. Battery: Two G-13 button cells (1.55v silver oxide). Size: 112 x 32 x 11mm (4.4" x 1.25" x 0.4"). Note that since it is a clock, there is no on/off switch. Casio MQ-1 in calculator mode. Casio MQ-1 in clock mode, showing 4:13pm and 44 seconds. 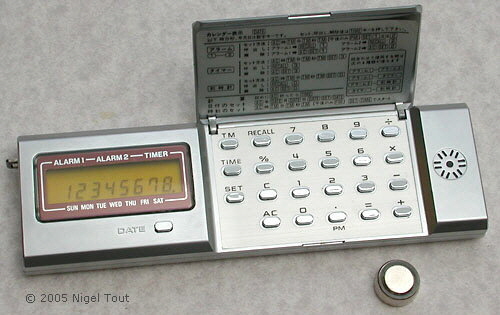 Distinctive features: Tiny calculator with clock, stop-watch, and alarm. Can perform time and date calculations. Display is 8 digits, LCD (yellow-filtered to cut out wavelengths of light harmful to the LCD). Input for date calculation is limited to January 1, 1901 to December 31, 2099 (so is Y2K compliant), taking leap years into account. It can calculate the number of days between two dates. Size: 121 x 36 x 11mm (4.75" x 1.4" x 0.4"). The MQ-2 is slightly larger than the MQ-1 and has an 8-digit display, instead of 6-digits, and an alarm. 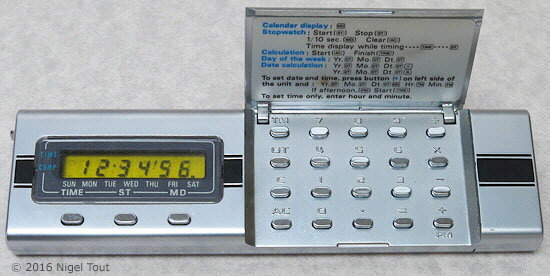 With advances in electronics and by using a liquid crystal display (LCD) it became possible to include a clock with the calculator where the display was continuously on. This was a great advantage over the previous Casio CQ-1 model with its power-hungry VFD display. These tiny calculators with clocks never really became popular, perhaps because they are not very convenient to carry around and use. They both have a lug to take a lanyard, so they could be worn around the neck. However, the keys are very tiny and close together making them difficult to use.